Spain's Sendero Historico: The GR1: Across Northern Spain from Leon to Catalonia. The GR1: Spain's Sendero Historico: Across Northern Spain from Leon to Catalonia: John Hayes: 9781852845698: Books - Amazon.ca. Spain's Sendero Historico: The GR1: Across Northern Spain from Leon to Catalonia (1st ed. Książka: The Gr1: Spain's Sendero Historico: Across Northern Spain from Leon to Catalonia John Hayes. The Gr1: Spain's Sendero Historico: Across Northern Spain From Leon to Catalonia. The Gr1: Spain's Sendero Historico: Across Northern Spain from Leon to Catalonia John Hayes · Everyday low prices, plus 3.99 shipping. The Gr1: Spain's Sendero Historico: Across Northern Spain from Leon to Catalonia. John Hayes: The GR1: Spain's Sendero Historico: Across Northern Spain from Leon to Catalonia. The Gr1: Spain's Sendero Historico: Across Northern Spain from Leon to Catalonia: Amazon.it: John Hayes: Libri in altre lingue. 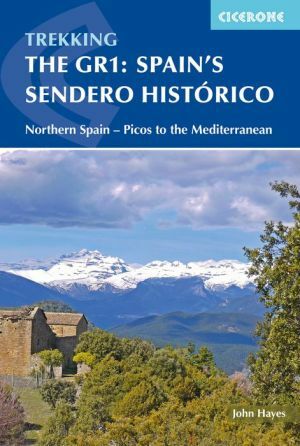 Cover of Spain's Sendero Histórico: The GR1 (GR1), traversing northern Spain from Puerto de Tarna in the province of Leon in the west to the Mediterranean near L'Escala in Catalonia, 10 days on part of Spain's Sendero Histórico, the GR1, across northern Spain in the foothills of the Pyrenees.